U2 rumbled into town yesterday; about halfway through their current North American tour. As always, they bring the party with them. This time around it featured music from their latest album (now almost a year old), No Line On the Horizon, and an impressive 360º stage show that is a masterful and fanciful manifestation of Bono’s obsession with making large stadiums feel like the small, intimate concert halls the band grew up in. Bono rockin’ the red laser suit. A series of walkways and bridges criss-cross out from the main stage in a way that allows for maximum interaction between the band and the audience. 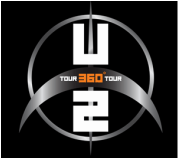 Overhead, enormous 360º video screens project iconic and provocative imagery along with images of the band themselves. 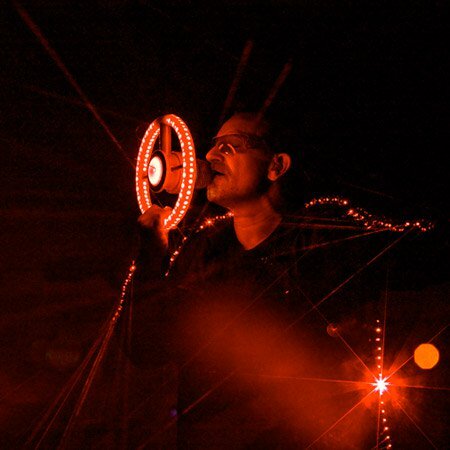 Countless lights flash and pulsate in a kaleidoscope of color and, if that weren’t enough, Bono does Peter Gabriel’s light bulb jacket one better by cavorting across the stage wearing a black leather jacket with 240 red lasers embedded in it. By God! This is a rock n’ roll show. Full of spectacle and music and ego and sweat and dancing and cheering and smoke and lights and, no doubt, applause. Love ‘em or hate ‘em, you’ve got to hand it to them… They keep the promise and they deliver the goods. They always have. 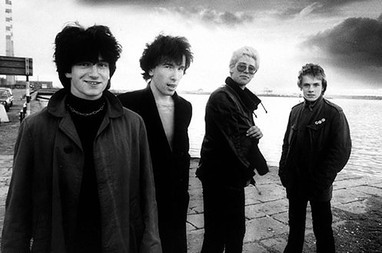 U2 — the early days. 1. Paying £2 to see an unknown band from Ireland perform on a tiny stage in the student union at Exeter University in the fall of 1980 on the basis of two paragraphs in Melody Maker. 2. Watching the band perform again later that year in a high school gym-sized hall in St. Albans, a small town outside London. The lights were all white. The band wore all black. They had one album to their name, and the genuinely enthusiastic British crowd showed their appreciation by inexplicably showering the band with non-stop gobs of spit. After the show I snuck backstage claiming to be part of the “American publicity team.” That ruse gave me the chance to: watch Bono discuss Jesus and try to pick up two girls at the same time; provide Adam with 50p so he could buy a cup of tea; swipe two really cool concert posters that I’d like to think are worth a fortune today on the Antique Road Show-Rock n’ Roll edition. 3. Being mistaken for their driver outside customs at Heathrow Airport as they returned from their first US mini tour in June 1981, loaded down with duty-free booze and electronics and the wide-eyed excitement of having just begun their life-long campaign to conquer America. 4. Showing The Edge the Melody Maker article where Bruce Springsteen singled out his guitar work as the single most interesting sound he’d heard while on tour in the UK promoting The River. 6. Vowing to see the band the next time they performed in Cleveland, and promising to bring a crowd. 7. Driving through a blizzard, from Kenyon to Cleveland, in a packed two-car convoy to see the band perform at the Cleveland Agora on a stage slightly bigger than the one in Exeter — but not by much. 8. Taking everybody to meet the band at their hotel after the show and Bono amazingly remembering my name. 9. Getting to see the band in Cleveland one last time, on the War tour, before they “made it to the majors” and never played a small stage like Music Hall ever again. 10. Witnessing the glitzy height of their glam and glitter phase on the Pop-Mart tour at RFK Stadium. 11. Being stunned by the amazing U23D iMax movie. A U2 performance is always a celebration in the truest sense of the word. It is both profound and profane, sacred and silly — like today’s Happy Medium Song of the Day, a non-album single released in 1982 entitled “A Celebration.” Long out of print and absent from any of the group’s compilations, the 7” is regarded as one of U2’s rarest singles. The song may sound dated compared to the sonic majesty of the band’s current repertoire, but I still love it for it’s goofy dance beat, youthful enthusiasm and unrepentant belief that rock music can save your soul. In light of Andy’s recent 20th birthday and Lori’s upcoming 49th, this seems like a more than appropriate musical selection.